With the iPhone 4S, however, Apple finally came to the realization that having a Reminders app of its own is a good thing. 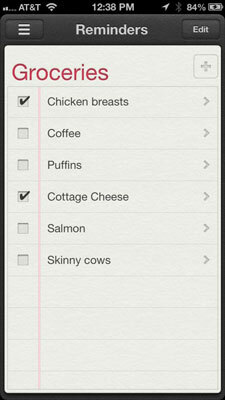 They had failed to provide a reminders or to-do app in its early iPhones, but fortunately several decent third-party apps helped fill the bill. The Reminders app isn’t just any ordinary to-do list: Reminders on the iPhone can be tagged to your location, and it also works nicely with Calendar (iCal on older Macs) and Reminders on a Mac running Mountain Lion, and iCloud. iCloud can keep reminders in sync across all your iOS devices and computers. Consider the power of tying a reminder to your location. You’ll be notified of the items you must pick up at the supermarket at the moment you drive into the grocery parking lot. Or perhaps a reminder to call your spouse will pop up before you open your front door following a business trip. Reminders are organized in lists. Apple supplies a general Reminders list, and a list that reveals the items you’ve completed. 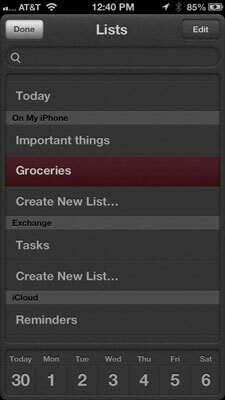 You can create your own lists, of course, perhaps one for groceries, another for the tasks you must do for the PTA. Lists show the due date or the location or both. You can swipe to the left or right to quickly jump from one list to another. In addition, tap any of the dates shown at the bottom of the list to reveal reminders due on that particular date. To add a reminder to a given list, tap the list in question. Tap the + button at the upper right, and type the name of the reminder you have in mind. You can also just type the reminder directly in an available space on the list. Tap Edit if you want to remove any items on the list or change their order. To add or edit a list itself, tap the icon with the three bars at the upper-left of the Reminders screen to return to the list of lists. From the screen that appears, you can also search through all reminders. To add or edit reminder details, tap the reminder itself. From the next screens, you’ll be able to choose a date and time to be reminded. You can also request to be reminded at a given location. Please note that the location feature doesn’t work with Microsoft Exchange or Outlook accounts or in every locale. And if your phone is locked, you may also experience Reminder delays. Reminders are a great reason to call on Siri. Ask her to remind you of something and she will do your bidding. You can view your reminders and see alerts in Notification Center. You can turn on Do Not Disturb in Settings if you don’t want to be nagged by a Reminder.